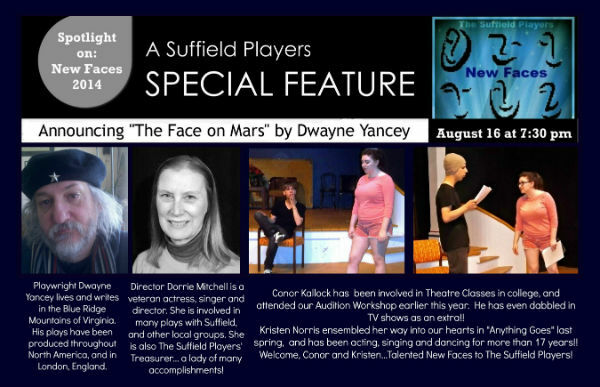 Here’s some of the publicity for my ten-minute script THE FACE ON MARS, which plays August 19 in Suffield, Connecticut as part of the Suffield Players’ festival of short plays. Here’s the present line-up of productions I have for the rest of the year. This entry was posted on August 8, 2014, 9:56 pm and is filed under News, Photos, Productions, Uncategorized. You can follow any responses to this entry through RSS 2.0. You can leave a response, or trackback from your own site.